Divination Maria lenorman remains popular for many decades. The Creator of this system managed with precision to details to see the future of Napoleon Bonaparte, Josephine de Beauharnais, and many other influential people. But most pleasant is that this true divination you will be able to study independently! To predict the future Mary used the 36 cards with different symbols, each of which had its own value. Use for divination Tarot regular playing cards is possible, though not recommended to do so. It would be better if you buy a special deck or make it with your hands. 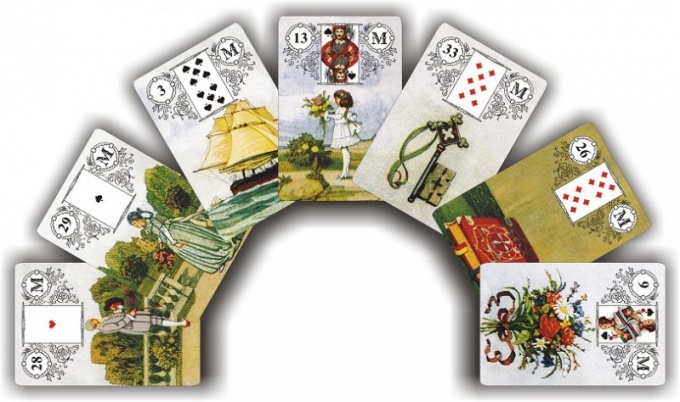 Wondering Lenormand, you can use two different ways. The first option applies to layouts in which subsequent positions are not closely related with the previous one. An example is the questions of "What it feels", "What it shows", "What are its objectives". In this case, you need to concentrate on the question that interests you to shuffle the deck, remove the left hand and then put on the table the top card. The second option applies to Lenormand divination on the situation or the relationship with such questions as "What he felt in the past", "What were his emotions in the present," "How to change his attitude in the future." In this case, as described above is laid out just the first card. Looking at its number, you have to remove the map, which is under the same number in the deck. For example, if you had a Ship, this means that you have to pull a third from the top card. For a start, it is recommended to learn a few simple variants of divination, including "Map of the day". This will help you get better acquainted with the deck and learn to make accurate predictions. Then you can move on to more complex layouts. The most difficult and the most interesting part of divination by Tarot is the interpretation of the situation. In this system, cards are very rarely interpreted by themselves. In most cases, to each of them, in the sky, the proofreader, or the fortune-teller lays out a number of cards and their combinations account for in the interpretation. When determining the values of the cards is very important to rely on your Association. The same situation can have different meanings depending on what emotions it invokes I guess, what gave the prophet his intuition. So, the mountain can talk about the obstacles or career development, rise or fall, difficulties or trials. The child may be associated with innocence, gullibility, purity, sincere emotions, immaturity, stupid whims. Therefore, learning divination, Lenormand, it is important not to rely on proposed by that interpretation, how to create their own, given their own observations and the particular situation. Try and you will see that this is a very exciting activity, which subsequently helps you to develop your intuition and learn to predict the future!